It’s that time of year again: back to school! The sales are on, so every parent and guardian is prepping for the back to school rush – but are your kids? Summer feels as if it lasts an eternity when you’re a kid, so learning that you may have to go back to school, or start going, can come as a bit of a shock to some children. There are some fun ways to help prep kids for the new school year to get them excited. Getting kids ready for school takes some preparation. You’ll need to get the kids up on time, have them dressed, their backpacks and lunches packed, and have them out the door and in the car or on the bus when the time calls for it. Jumping right into this school routine can be a bit of a shock for both kids and parents so getting a head start can help you both ease into things. Not only will this make your back to school schedule easier to adjust to, but it will also help everything go over much more smoothly, too. Introducing educational activities and games can help get kids back into learning mode. Ideally, kids should be exposed to these kinds of activities regularly throughout the summer so that they stay up to speed, but introducing it more so towards the end of the summer can help get kids back into the mindset they’ll need for the classroom. Some pre-k, kindergarten, and elementary school grades hold open house events for kids, parents and teachers. These get-togethers allow everyone to get to know each other. As a parent, you’ll meet your kids’ teachers and their classmates’ parents. For kids, they’ll see what their classroom will be like and who they might be friends with this year. These preliminary meetings also allow you and your kids to get a taste of what their curriculum will be like for the year. Seeing their classmates and their teacher can help get kids ready for when school will actually start, and you can begin brushing up on topics that might have been covered in the open house if you want to help give your child a head start. Reading has been known to help kids adjust to many different types of situations, and school just happens to be one of them. Get your child a personalized book like the ones from KD Novelties so they can better imagine themselves at school once it starts. Personalized School Books like “My First Day at School” and “School is Fun” can help get any child back in the spirit to learn. When they see their names as part of the story, kids will get excited to find out what happens next and read through to the end. Reading is a great thing for kids to do in general. It is important that you make sure that your child keeps up with their reading level over the summer so that they won’t fall behind. 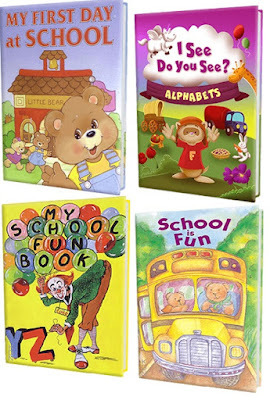 There are other books to consider, too, like “My School Fun Book” and “Personalized for Pre-School” which are more geared toward activities that can help kids get used to doing classwork. Introducing kids to their coursework in a fun way can help get them excited to start school, whether they are starting for the first time or returning after a long, fun-filled summer.